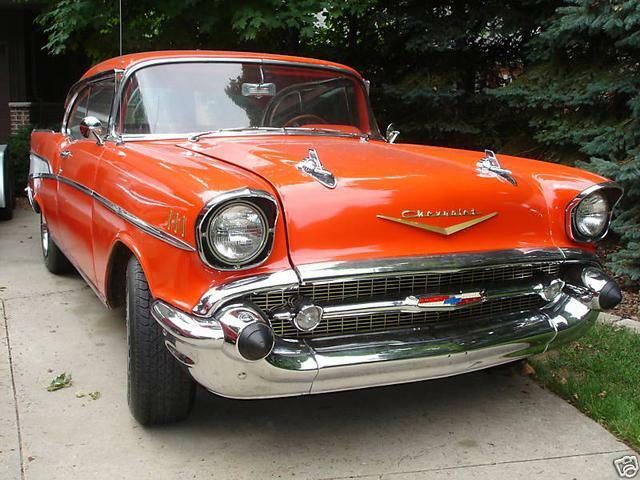 57 Chevrolet Belair 2 Door Hardtop Sport Coupe, red with a non matching red leather interior, cammed up 350, turbo 350 automatic, 605 power steering, power disc brakes, Corvette Rally wheels, runs and drives excellent. I flew to Wisconsin and drove this car back to Austin with a brief stop in Iowa to relive a little bit of my childhood. It was just like high school cruising mainstreet in a 57 Chevy. It is a very nice driving 57 that I would not hesitate to drive anywhere. It is not a perfect car, but it’s not priced like a perfect car. If it stays here very long, it will probably get an original interior, a 4 speed and a/c and get more expensive. OK, I have a new love with a manual overdrive transmission, so I have lowered the price. This is a lot of 57 Sport Coupe for not a lot of money.........Too Late for this one, but for just a few more dollars you can still have the turquiose Hardtop with an overdrive. This 57 is on it’s way to Sweden to join that Merc S-55 I sent over there a few years ago. I hope Pihl enjoys driving this Sport Coupe around Sweden as much as I have enjoyed driving from Wi to Tx and around here. It has arrived at it’s new home in Sweden to another very happy customer from far far away.